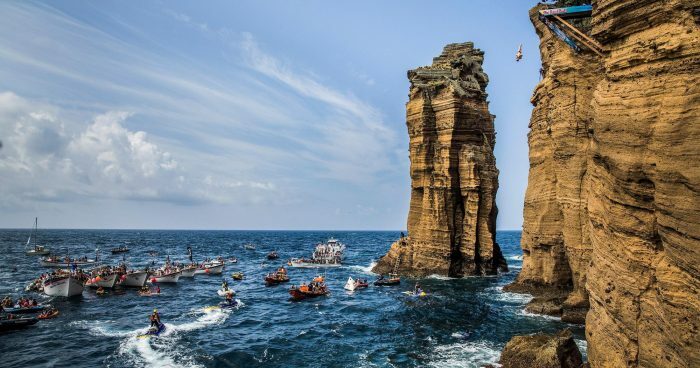 Over the weekend, I came across these breathtaking (literally, for me) photos from the Cliff Diving World Series. Did you know that was a thing? It’s incredible! Divers leap from platforms 90 feet high—three times that of the Olympic high dive—and reach speeds of 50 miles per hour. It takes about three seconds for them to hit the water—in which time they do complex rotations before returning to a stick-straight, feet-down pose. These photos are of Islet Vila Franca do Campo in Azores, Portugal, a couple of years ago. This year’s series—the eighth—begins in Texas this weekend, at Hell’s Gate in Possum Kingdom Lake, before moving on to Denmark, Portugal, France, Italy, GBR, Bosnia/Herzegovina, Japan, and finally, the UAE (Dubai) in late October. 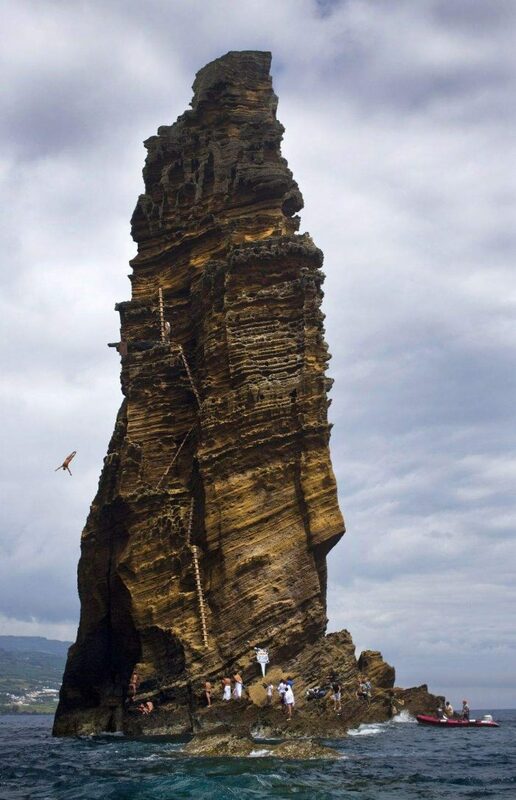 I watched some of the videos of the dives, and it really gave me vertigo! Only three or four dozen athletes in the world do this, apparently. About the risk: “The highest risk of injury occurs during the landing phase, when parts of the body are already exposed to absolute deceleration and others, above the surface, are still at full speed. At this point, maximum physical tension is absolutely crucial. Immediately after hitting the water, the athlete has to actively dive away to avoid compression or contortion of parts of the body due to the hardness of the water. 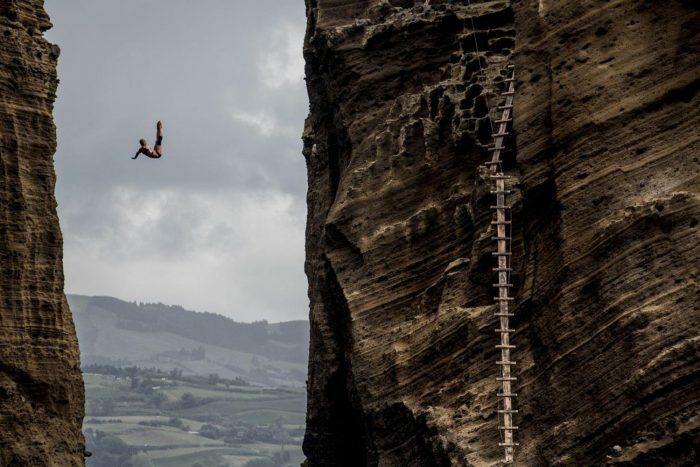 … A pancake landing from such heights can be compared to a hard landing on concrete from about 13m.” The feet-first entry is that the impact in to the water is far too great for a head-first entry, the arms, neck, and shoulders just can’t take it. They must always go feet first, completely vertical, with as little splash as possible. Here’s a good three minute clip about the series if you’d like to see it in action. And as summer begins, it’s a good reminder to anyone diving into rivers and lakes—feet first! P.S. Swimming in the Yuba River.